Our SuperHatch is an Advanced Incubation Medium that allows for easy Moisture Monitoring (it Changes Color) and is Indefinitely Reusable. Great for Gecko Eggs. INFORMATION: This is a course grade ceramic product (Calcined Clay). It has excellent porosity and is the next generation in egg incubation media. It does not break apart over time, does not compact, or float. Its color changes based on the amount of water it contains so you can easily monitor visually for changes in moisture level. It can be re-used indefinitely by cooking or boiling to sterilize. An inert, neutral, 100% natural mineral blend, this product lasts year after year without breaking down. 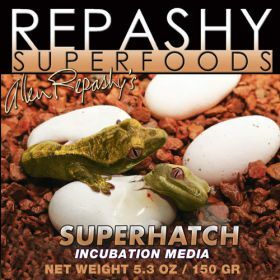 INFORMATION: SuperHatch has extreme porosity combined with very fine internal structure size. This allows SuperHatch to absorb and hold large amounts of water, with a very slow rate of evaporation. This helps control the quick release of water which causes surface moisture and condensation. Instructions: Place SuperHatch in a sieve, strainer, or in a porous bag. Soak in water for a few minutes, remove and let drip dry. Add SuperHatch to your incubation container, filling it approx. 1/2 full. Add eggs, and you are good to go! Saturating the SuperHatch and letting it drip dry is a suitable mixture for most species. Some species require less moisture in the container, and this can be easily accomplished by taking the saturated SuperHatch and mixing back in a % of dry SuperHatch. You can also mix SuperHatch with water on a weight / weight, or volume / volume ratio to get the required moisture level. Always use the largest feasible incubation container possible. A minimum recommended size is a 16 oz. container for a pair of gecko eggs, and a shoebox size container for 10 - 20 eggs. The more volume in the container, the less drastic environmental changes can effect the conditions inside the container.